The name of the first month of the year comes to us from ancient Rome. 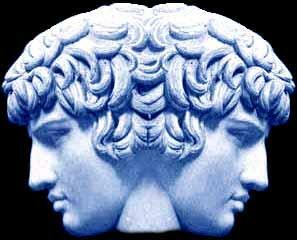 Janus was not only the first of the Roman gods, but also the god of beginnings, of gates and doorways, of transitions and of time. Depicted as having a face on both sides of his head, he looked to the past and to the future. This is why in Shakespeare’s play Othello, Iago, a two-faced character if ever there was one, invokes the name of Janus when one of his duplicitous plots fails: “By Janus, I think no” (I.ii.33). If the gateway to Janus’ temple in Rome was closed, it meant Rome was at peace; if open, Rome was at war. The gate was usually open. We see a few other uses of this name in English, most notably in the word janitor, a door-keeper. Another occurrence of this word root came to me completely by surprise as I researched this article. One of my favorite opera pieces is the “Chorus of the Janissaries” from Mozart’s The Abduction from the Seraglio, set in a Turkish harem (it’s a rousing, infectious number – check it out!). I always wondered what “Janissaries” were, but never bothered to investigate. They were door-servants to the Turkish sultan, taking their name from Janus, the god of doorways. Besides being the name of a cartoon penguin, “opus” is a word used to refer to a creative work, usually musical and of considerable scope (as in a “magnum opus”). The term comes from the Latin word for work. Musical compositions are given an “opus number,” such as Beethoven’s Opus 125, also known as his Ninth Symphony. In this usage, the word is usually abbreviated as “op,” a common sight on classical music recordings. Of particular interest is the plural of this word: opera, meaning works. This is why compositions that include music, dance, scenery and costumes are called operas, as they combine works form various disciplines in the arts. Other common words from this root are operate (as in surgery, or medical work), and the operating system of your computer, which makes it work. While we’re talking about music and operas, why do we yell “bravo!” at the end of a particularly fine performance? This word comes from the Italian for “good.” If you really like a performance, you can yell “bravissimo!,” which expresses approval in the extreme (“most excellent!”). Or you could just yell “excellent!” or “awesome!,” but you’d likely get some unwelcome stares for your faux pas (French: false step).